Good morning Junkies! Today, I've got a couple of items for your viewing pleasure. 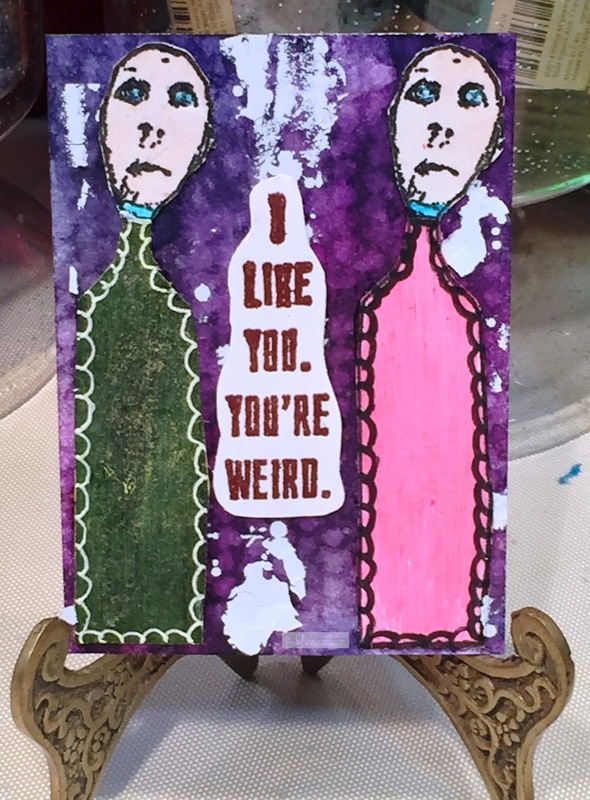 Up first, is an ATC I created using the new Double Weird and Double Weird Sayings August releases. I sprayed the background with Art Anthology Colorations in Plush and Ink Spot. Then I used the Distressed Removal Stencil Technique found on the Sensational Stencils CD to add some interest to the background. Next I added some white distressed rubons on the sections of the ATC I knew would show. 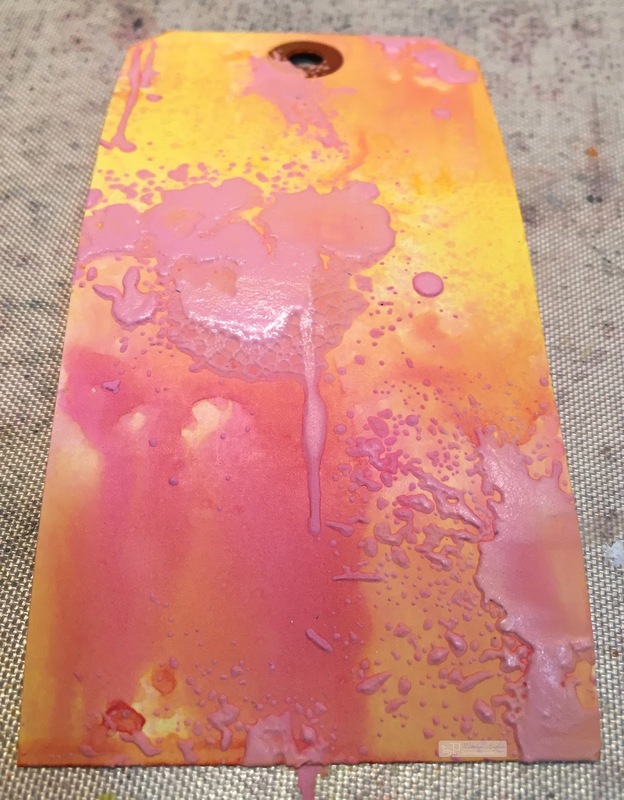 I stamped Double Weird onto a piece of card, cut out, and painted with Art Anthology Velvet in Lemon Tart and Fiji (left side) and Fiesta and Fiji (right side). Their faces were painted with Portobello to give them a flesh tone. 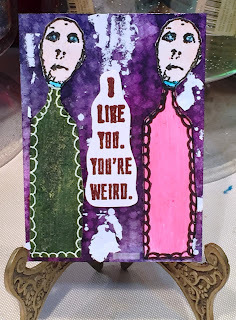 Next, I stamped one of the sentiments from Double Weird Sayings in Versamark ink, embossed with burgundy embossing powder, then cut out and put in place. Next, I created a tag with with the new Fun and Games release. 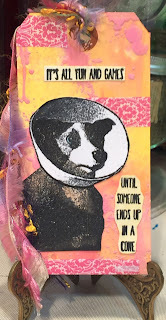 I sprayed a tag with Art Anthology Colorations in Glorious and Heart, then mixed some Fiesta Velvet into Mud texture paste and added some interest with the Art Anthology Such a Drip Stencil. 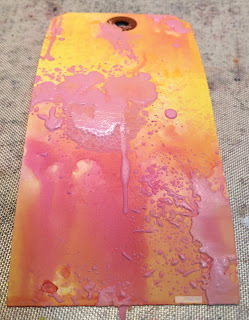 I thin stamped Fun and Games onto a piece of card, cut out, and painted. The dog is painted with Art Anthology Kona Velvet, the cone with Cotton Velvet, and the sentiment with Art Anthology Timeless Colorations. I added a few pieces of washi tape for interest and two pieces of matching fiber to drape from the hole in the tag. These were fun to create and I hope you enjoy them as much as I do.